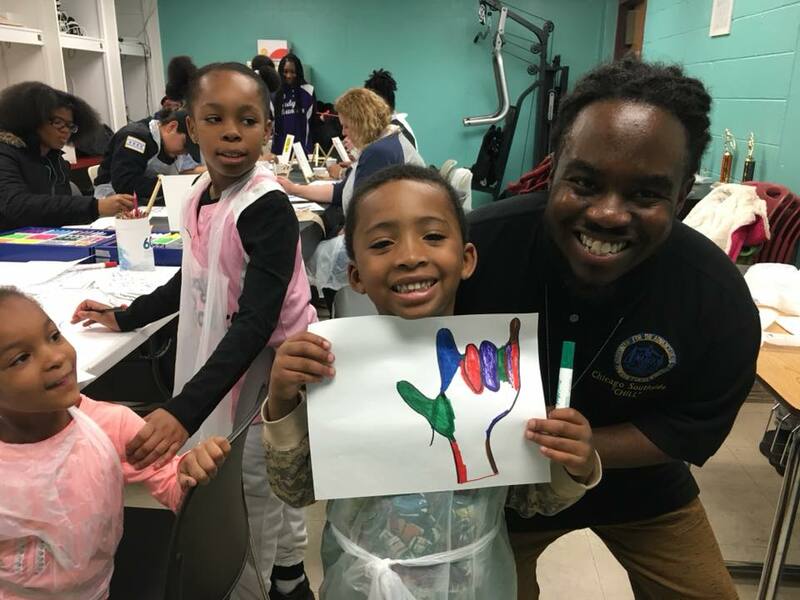 CYC youth worker Devin Swift-Bailey poses with a child and his interpretation of peace: the sign language phrase for "I love you." At CYC-Crown, teens, children, and community residents have a united mission: a peaceful summer. On April 14, nearly 70 people gathered at our Center in South Shore for the South Shore Teen Summit. CYC youth and teens, participants from Lost Boyz, the Chicago Police Department, and the NAACP all gathered to participate in meaningful conversations and learn to de-escalate violence. Andra Medea, who developed CHILL, a program that teaches youth to recognize the biological effects of anger and confrontation and develop techniques to de-escalate conflicts, was also present. CHILL has been a part of the CYC curriculum for about a year, and Devin said he has seen positive results. Teens and community members participated in peace circles intended to spur community conversations. In addition to a presentation on how to de-escalate aggressive situations before they turn violent, Devin said they wanted to focus on how teens should interact with law enforcement to achieve peaceful and mutually respectful solutions. Devin said when organizing the event, he reached out to the Chicago Police Department to facilitate peace circles inspired by their Bridging the Divide collaboration with the YMCA of Metro Chicago. During the peace circles, the police offered answers and posed questions and pushed for open conversations. The NAACP also took time to discuss restorative justice practices. CYC youth also worked on a peace mural. The mural will be a collage of different interpretations of peace. “With the peace mural, we hope to use our individual interpretations of peace to show what is important to our community,” said Monica Wizgird, the CYC Arts & Innovation Coordinator.